I purchased the upgrade to RealPlayer Plus, but when I follow the instructions it asks me to purchase again. How can I get the upgrade I already paid for? We recommend uninstalling any previous versions of RealPlayer before installing the latest version. 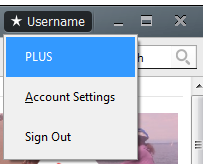 If you update to the new version after paying for RealPlayer Plus 18, during installation you may see a window asking you if you want to "Continue without Plus" or "Upgrade to Plus." Because you have already paid, you should click Continue without Plus--you will need to do this twice. There is no separate download for RealPlayer Plus; to unlock the Plus premium features you purchased, just open RealPlayer and sign in.